Over the summer we’ll be refurbishing the Special Collections Reading Room here at The John Rylands Library. The refurbishment will offer improvements to the reader experience together with enhanced security and care of the collections through a redesigned staff workspace. The room, located on the fourth floor of our Deansgate site, is an air conditioned, quiet space where readers can make advance requests for a closer look at items from our world class Special Collections. These collections are available for anyone to access, whether academic or member of the public. Exact dates for the start and end of the refurbishment will be confirmed in due course. Whilst the refurbishment is underway, the Reading Room will operate out of the Christie Room – a quiet space in the historic part of The John Rylands Library. Services and routes throughout the building may alter at various times during the refurbishment. Please check the Special Collections Reading Room webpages for any updates ahead of your visit. A personal tip is to source funding elsewhere. I applied to the Arts Council, successfully. Over the last 12 months we’ve had the privilege of working on the Archive of Dom Sylvester Houédard or dsh as he preferred to be known; and what a challenge it’s been! The archive, well Accession 1 of the archive, consists of 97 boxes of material with only a handwritten list to accompany it. Our project was to discover in more depth what was held inside these uncatalogued boxes. Clare & Karen discussing material. dsh was born in St Peter Port Guernsey. He read history at Jesus College, Oxford and served his National Service in British Intelligence in India. He became a monk at Prinknash Abbey in Gloucestershire in 1949. As a monk he embraced the reforms implemented by the Catholic Church through the Second Vatican Council, 1962-1965. The need to encourage dialogue between religions, especially non-Christian faiths, was a cornerstone of his belief system. At the same time he contributed to biblical studies and became the literary editor for the Jerusalem Bible, 1961. 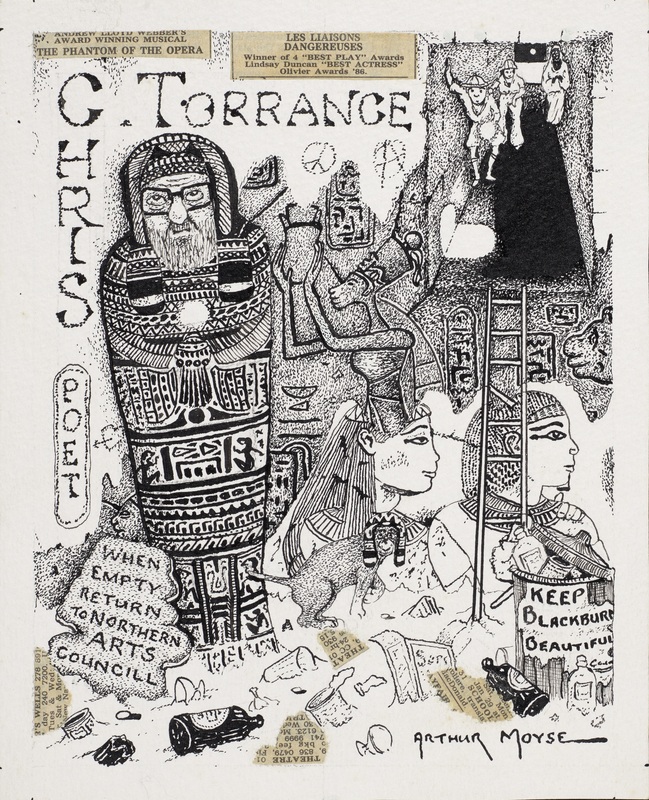 He also became a leading figure in the avant-garde Concrete Poetry Movement. His work appeared regularly in exhibitions and ’zines. 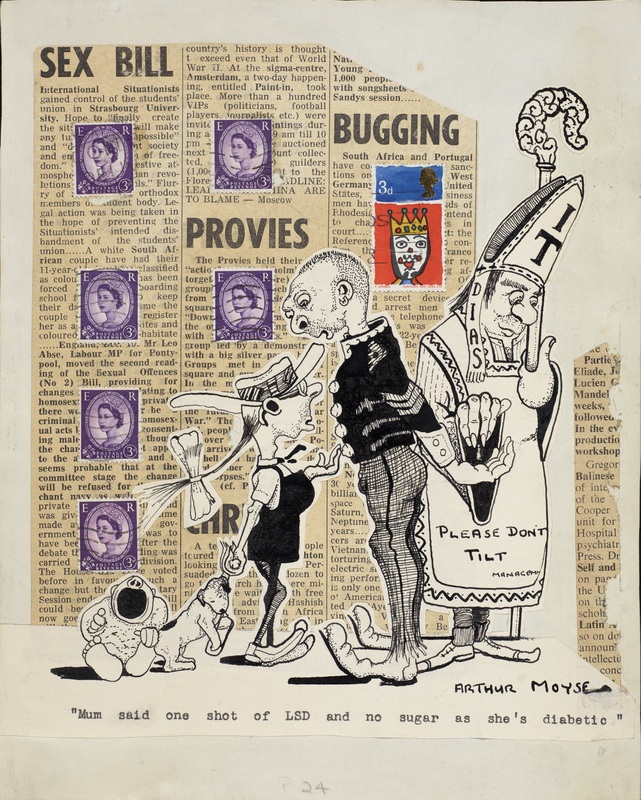 The Rylands holds his collection of poetry and art magazines from the 1950s, ’60s and ’70s, which Fran Horner, a placement student at The John Rylands Library blogged about last year. 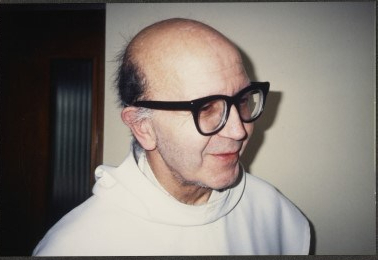 And it’s this juxtaposition of Benedictine monk, serious theologian and hipster, deft exponent of conceptual art and concrete poetry that makes him such a fascinating character. Photograph of Dom Sylvester Houédard. By kind permission of Prinknash Trustees. Although the collection is mainly made up of dsh’s theological writing, it quickly became apparent that there is a wide breadth of material, topics and formats included. 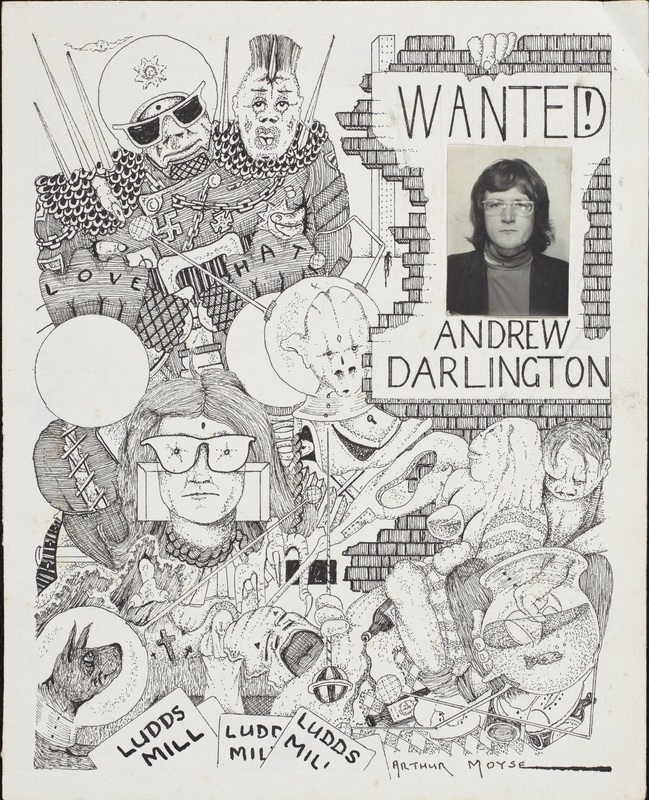 There were many sheets of paper covered in tiny spidery, almost illegible, writing, but we also discovered art works, typestracts, reversals, concrete poetry, photographs as well as contributions from other artists and poets. This isn’t a collection rooted in the personal; unlike his fellow archive companion and friend, Li Yuan Chia, this is an eclectic and intriguing mix of religious and ‘arty’ material. Of particular interest to us were the seemingly random objects lurking between the theological musings, which we would like to share. 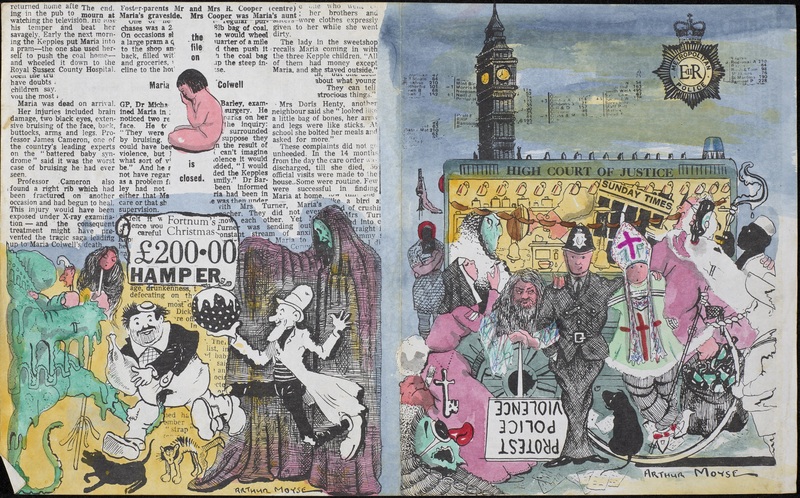 It’s unclear why these items are in the collection – were they used to inspire his artistic practice or like us, did he find these quirky items amusing or perhaps he just mislaid them in amongst his papers? I think the gentle aromatic aroma of minty chocolate will live with us for a while, not the usual musty bookish wafts you expect from an archive, but a squished After Eight mint sandwiched between sheets of paper; a #BizarreBookmarks or monk-ish nibble maybe? Enjoyable highlights were the solid jelly baby and the petrified liquorice torpedo – both transformed into works of art. Alas these are no longer part of the archive and have been removed by our Conservation Department, although captured here for posterity by the Imaging Team. We came across a tiny clay bird’s nest containing even tinier eggs carefully wrapped in tissue paper with no note of explanation. We decided this was another element of dsh’s quirky nature. This item was accompanied by a lone marble overshadowing the nest and eggs. To us this was just another example of objects within the collection having no rhyme or reason for their inclusion, but we find interesting none the less. 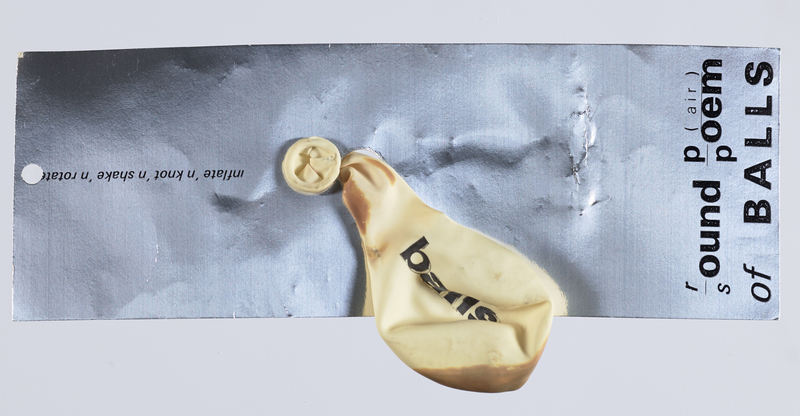 We were intrigued by the solid ‘balls’ balloon attached to silver card with the words ‘inflate ’n knot’ n shake’ n rotate’; the disintegration of the balloon and it’s firmness adding poignancy to the item as it contrasted with the usual expectations and nature of a balloon. Discovered in the midst of dsh’s works was a plastic spanner, cheekily attached is a note that reads: ‘Take this flexible little spanner and fling it into the works of various institutions throughout the land. CAUTION: The manufacturer accepts no responsibility if this spanner bounces back’. Gosh! Anarchy on the shelves in the Rylands! 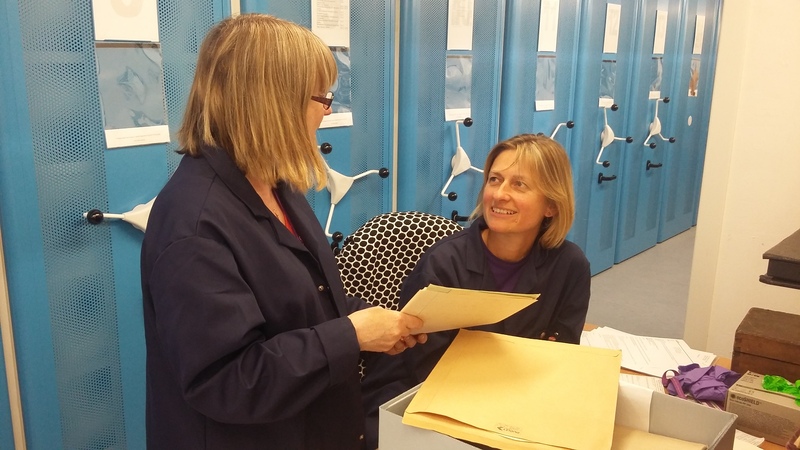 And we were amused to see that an everyday envelope containing screws wrapped in a disintegrating elastic band had been preserved – such an ordinary find, one that will resonate with many, but why has it been saved among dsh’s papers? Or is it an oversight? 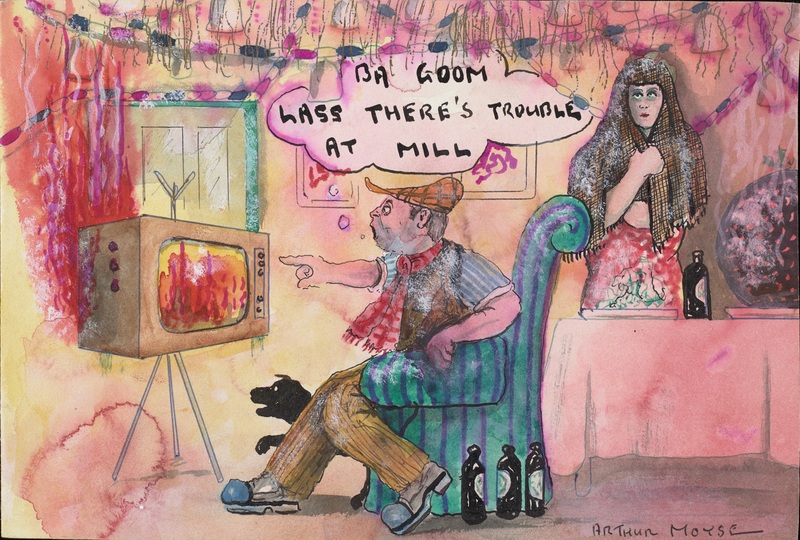 Through this collection we saw a very serious side to dsh through his theological research and teaching, a creative side through his poetry and artworks, but also a lighter more playful side demonstrated by these everyday items. It’s intriguing to ponder on why he had kept them and what significance they had to him. What would the objects you keep or fail to throw away tell future researchers about you? Permission has been granted by the Prinknash Abbey Trustees to use images from the dsh Collection. With many thanks to the imaging staff at The John Rylands Library for the brilliant photographs too. The University of Manchester Library has digitised a second tranche of unique documents and rare printed material relating to The Peterloo Massacre. These include a collection of handbills, placards and handwritten letters gathered by the notorious Rev. William Robert Hay (1761-1839). Rev. Hay was one of the ten magistrates present who ordered mounted soldiers into a crowded field to arrest Henry Hunt on 16 August 1819. That afternoon at least 15 people were killed and around 700 were injured by sabres and truncheons or trampled by horses or the panicking crowds. As evening fell Hay hurriedly wrote to Lord Sidmouth, the Home Secretary, setting out the magistrate’s version of events. In it he seriously downplayed the number killed and the types of injuries inflicted on the crowd. Not only were Hay and the other magistrates praised by the Prince Regent for their part in the massacre, they were also rewarded financially. In January 1820, the Government appointed Hay as Rector of Rochdale, which was one of the richest livings in England. There was no public enquiry into the killings. Rev Hay was an avid opponent of radicalism and made it his business to collect handbills issued by both those loyal to the government and those issued by reformers. Two of my favourite items are oversized loyalist handbills, published in the days leading up to Peterloo, attacking what they see as outrages by radical agitators. The language used is powerful but what is striking is how big they are. Such publications were designed to be pasted on the wall – measuring 29 inches by 20 inches they could not fail to attract the attention of those passing by! Note the final entreaty on the first handbill to ‘Fear God, Honour the King’. Public notice issued by the magistrates declaring illegal the Public Meeting planned for 9 August 1819. The meeting was rescheduled for 16 August and became known as the Peterloo Massacre. English MS 1197/19. Copyright University of Manchester Library. Notice issued by the Magistrates on 17 August 1819, the day after the Peterloo Massacre, warning the inhabitants of Salford Hundred to abstain from Military Exercise, “which in many instances has been connected with Seditious and treasonable Purposes…”. English MS 1197/43. Copyright University of Manchester Library. How did these papers end up at The John Rylands Library? We know from correspondence between Dr Henry Guppy (the first Librarian at The John Rylands Library) and A. P. Wadsworth (then editor of the Manchester Guardian) that the collection arrived at the Library in 1940 as a way of keeping it safe and available to researchers. Chetham’s Library in Manchester also holds material collected by Rev. Hay including 17 scrapbooks of newspaper articles, letters, poems, advertisements and random ephemera. Letter from A.P Wadsworth to Dr Guppy providing a brief background to the Peterloo manuscripts, 8 August 1940. English MS 1197/1. Copyright University of Manchester. Another highlight of our Peterloo collection is a recently acquired Report of the Metropolitan and Central Committee appointed for the relief of the Manchester sufferers … (London: printed for William Hone, 1820), ref. R233016. This printed pamphlet documents the activities of the London committee who worked alongside the Manchester Relief Committee to coordinate the best distribution of aid. In the weeks following the Peterloo Massacre money was collected to help the injured and the families of the dead. 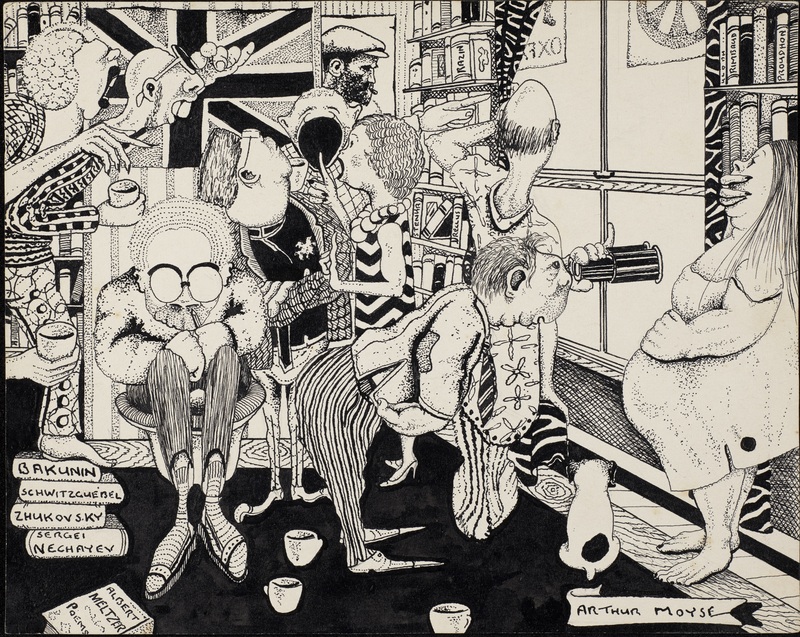 There was no Welfare State to assist those whose health and livelihood had been destroyed and voluntary subscriptions were crucial in saving many of those hurt in the massacre from complete destitution. Many victims hid their injuries from unsympathetic employers and parish officers who refused to support destitution caused by political activity. The appendices of this volume record the names, addresses, occupation and injuries of those caught up in the violence. It offers a poignant reminder of the many lives that were blighted by Peterloo. But most of all, it’s an important corrective to the official record which downplayed the number of dead and injured and tried to pass off the event as a riot. Those familiar with the streets and building of Manchester will surely be fascinated by the various maps and plans of the site. English MS 1197/85, Plan of St Peters Field with the Avenues leading thereto, shades the undeveloped area of Manchester known as St Peter’s Field as blue and intriguingly gives the height of the wall surrounding the Friends Meetings House (which was scaled by some of the escaping crowd). Plan of St Peters Field with the Avenues leading thereto. English MS 1197/85. Copyright University of Manchester Library. I particularly like the 1919 stylised Plan of Peterloo which not only gives the position of the relative groups of military, magistrates, hustings and people, but also depicts them in relation to buildings which are standing today. I find this immensely helpful when trying to get a sense of where the site is – the wall of the Friends Meetings House that faces Bootle Street is one of the few built structures dating from that period that remains to this day. The Portico Library is another. Plan of Peterloo, from F. A. Bruton, The story of Peterloo, written for the Centenary (Manchester: Manchester University Press, 1919). R46153. Copyright University of Manchester Library. The University of Manchester Peterloo collection can now be accessed online. We hope the sources will be widely used in the Manchester History Festival. If you require further information on any items in this collection please contact Janette Martin. With many thanks to the imaging staff at The John Rylands Library and to our summer work experience student, Caitlin Rutherford from Brighouse High School, for her work on the project. The greatest impulse of the suffragettes was to create a disturbance. To make themselves seen and heard so that the pressure mounting to give women the vote could no longer be ignored. Their deeds-not-words manifesto was the key to this, but also vital was the way in which news of these deeds spread, the massive publicity that was generated by their noteworthy tactics. The media coverage of suffragette activity was essential for the success of their campaign. The tension between the more peaceful suffragists and the more vigorous suffragettes was certainly documented and often vilified in the mainstream press. Punch was particularly fond of depicting the suffragette as a withered and screaming harpy in its cartoons, suggesting that militant suffragettes were harming the suffrage cause rather than furthering it. The University of Manchester Library holds a number of Women’s Suffrage Archives including those of the International Woman Suffrage Alliance. The IWSA cuttings volumes are filled with cuttings documenting both suffragist and suffragette activity, many containing photographs. This striking image is of Manchester’s own Emmeline and Christabel Pankhurst in prison uniforms. It is shocking and is designed to be: a powerful visual representation highlighting their commitment to the cause. In fact, the Pankhursts were masters of publicity. They understood the power of the media and regularly corresponded with the then editor of the Manchester Guardian, C.P. Scott. Deciding that support from mainstream media was not quite working for them the WSPU (The Women’s Social and Political Union) took matters into their own hands and started their own newspaper in 1907, Votes for Women. Tin badge with a logo designed by Sylvia Pankhurst. Holloway Brooch. This was designed by Sylvia Pankhurst in about 1909. 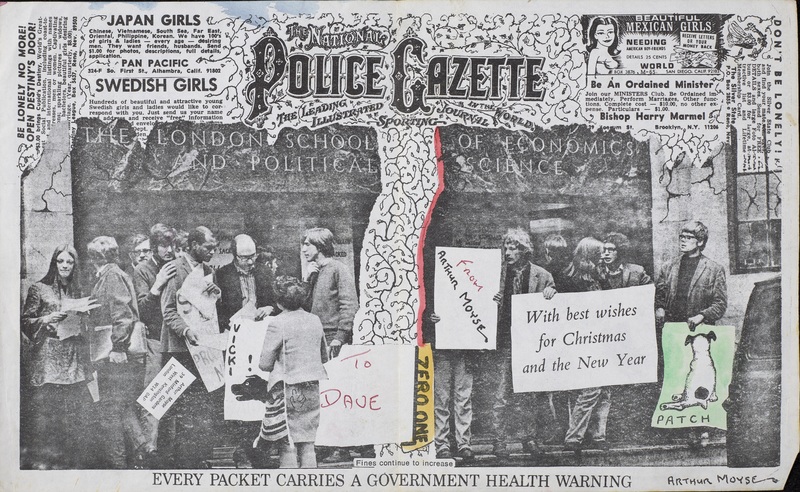 Images of Sylvia Pankhurst’s work Courtesy of Museum of London. Come to see more material relating to suffrage and suffragettes displayed as part of our Women who shaped Manchester Exhibition, on until the 10th of March. All images unless otherwise stated are copyright of the University of Manchester and can be used under the Creative Commons Attribution-Non Commercial-Share Alike Licence. With thanks to the Imaging Team.